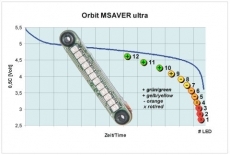 The M-SAVER ultra is an optical voltage monitor for 4-,5- or 6-cell NiMh (or 2s LiFe/LiPo) batteries. It informs you any time about the voltage state of your receiver battery. 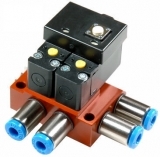 It is simply plugged into an unused servo output of the receiver. 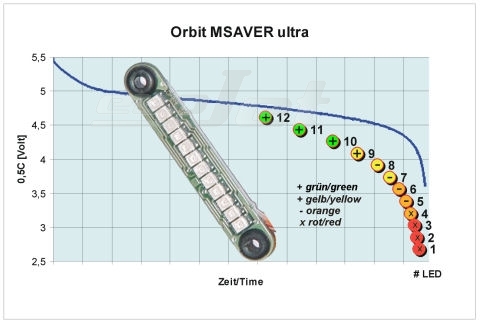 An ultra-bright twelve-segment LED bar digitizes the course of the receiver battery voltage into four ranges: green, yellow, orange and red. Thanks to its memory function, the current battery voltage and the smallest voltage measured so far (under load) are displayed by turns. If the LED display drops into the critical range (orange/red) while the battery is under load, the model should not be started any more !